When electric lights first began to illuminate the world at the end of the 19th century, a light-starved populace wanted as much of this scarce commodity as it could get - never mind the glare or eye-dazzling brightness. In the 1920s, however, some businesses, like movie theaters, began to appreciate the benefits of more subtle types of lighting. In a darkened theater, of course, people want to see the play or movie but still be able to navigate in or out without crashing down on their neighbors. A soffit simply means the underside of any architectural feature, like the eaves of a house or the overhang of a proscenium arch above a stage. Theaters were able to provide a softer, indirect light that could help guide patrons to their seats while still allowing the audience total immersion in the main point of light - that is, the movie. Art deco architects began using this type of soffit lighting in commercial applications soon after, and soffit lights have remained a key piece of the lighting puzzle ever since - not just in businesses but in homes as well. Lighting consists of three types. There’s ambient or general lighting for a large area, such as might be provided by a chandelier or overhead light. Another type is task lighting, such as floor lamps for reading and desk lamps for studying and writing. The third type is accent lighting, which adds drama to a room and focuses attention to a specific location, putting it in the most flattering light possible. The best-lit spaces combine all three elements. Though soffit lighting has many uses, it especially shines in accenting a particular part of a room and bathing it in a mellow, soft light, in contrast to the often-harsh glare of overhead lights and lamps. For example, a downward wall washing accent fixture can simply wash light down a wall to softly and subtly highlight a piece of art or furniture, a living plant on or near the wall, or even the texture of the wall itself. Wall washing sees most of its usage in museums, art galleries and other public spaces, and it’s also used as landscape lighting. But its cool, contemporary look makes it suitable for many applications in high-end homes, particularly if you’re interested in accenting a piece of artwork with a unique light. Though accent lighting appears soft, it must have some brightness in order to stand out from ambient lighting. LED lights do this, standing out in a room without spoiling the effect with an unnatural glare. In addition to their aesthetic quality, LED lights offer many practical advantages for soffit lighting. First, light-emitting diode lights are energy efficient, saving up to 90 percent of energy when compared to some other forms of illumination. This is a benefit for the environment as well as your wallet. Another green perk: LED lights also contain no hazardous mercury. Also, they’re safer and easier to work with than other types of lights. And unlike glass lights, they’re unbreakable and have a long life — some up to 100,000 hours or more than a decade of continuous usage, which definitely puts them in the low-maintenance category. 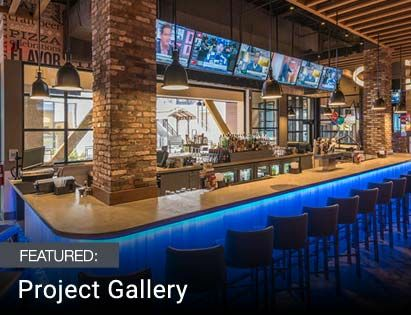 LED lighting ideas include soffit lighting in malls, offices, and public buildings, where maintenance may be difficult and costly. After the initial installation of LED soffit light strips, it’s likely that they’ll rarely, if ever, need to be replaced. Other LED accent lighting ideas include the perimeter lighting of a corridor, softly lighting the walls of a home theater or screening room, or lighting accent pieces in a living room such as a built-in bookshelf. Outdoor soffit lighting ideas include landscape and architectural feature lighting, such as along the edge of building below an overhang, where the downward facing light grazes the texture of the exterior materials, making for a striking visual appearance. Two types of LED lights often are used in soffit lighting: tape lights (or strip lights), which have very bright output but can be harder to install; and rope lights, which are easy to put in but which don’t offer as much light output. Merging these two concepts, we’ve come up with a happy hybrid that brings you the strongest features of each by offering LED Tape-Rope Hybrid lights. 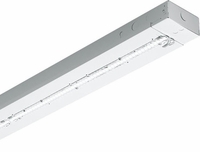 This advance in the evolution of LED lights is the next step in linear accent lighting. 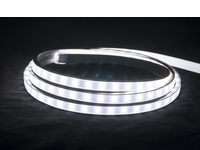 The LED Tape-Rope Hybrid lights provide just the right level of light to make accented pieces stand out, while their flexibility makes them extremely easy to install. Of course, accent often means bold and bright color, and lots of it, and LED lights give you the choice of an entire palette of vivid tones. Our versatile, professional-grade, color-changing RGB tape light solutions are perfect for accenting soffit spaces. 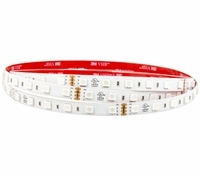 Unlike the limits that fixed-color strips place on you, the color-changing RGB lights lets you dial in the particular color you want for your project or move through colors in a variety of styles. 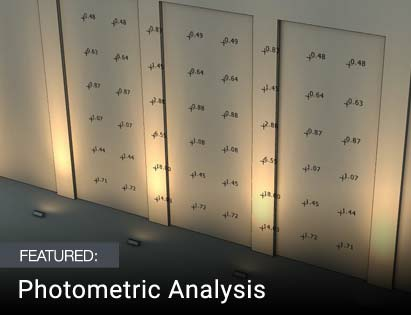 In this regard, it’s also perfect for backlighting glass or acrylic panels, cove accent lighting, and storefront displays. 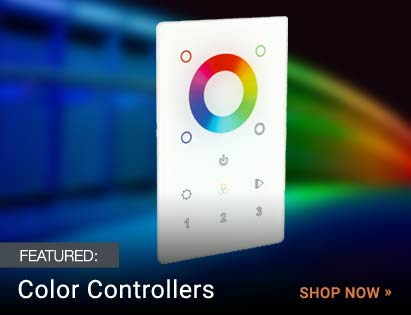 Fully DMX compatible RGB lights are also suitable for advanced installation in bars, lounges and nightclubs. Of course, they also can enjoy multiple uses in just about every room in high-end homes.